Easily set up recurring ACH payments with ChargeOver and save on transaction fees. Get paid on time and stop chasing payments every month. Custom payment plans and subscriptions. No manual invoicing and data entry. No awkward talks about overdue invoices. Some days are painful, inefficient, and uncertain. Spending too much time on manually creating invoices and entering payments every month. Using a clunky combination of tools to collect payment details and to process recurring payments. Needing to delicately remind customers about overdue invoices, at the risk of hurting the relationship. Needing to send customers to an unsafe and unbranded 3rd-party form to enter their credit card details every time they need to make a payment. Never knowing when a payment will arrive. Those are the parts of running a business we could do without. And we thought others could do without them, too. That's why we created ChargeOver—the web-based software for recurring billing that integrates seamlessly with all versions of QuickBooks, is easy to use, and can be set up within two minutes. Although you can schedule recurring invoices in QuickBooks, you must still wait for customers to see the invoice, process it, get it approved, and finally send the payment... That could take weeks! Then, as the due date approaches, you struggle to decide whether to send a reminder and risk appearing pushy and desperate, or to say nothing and risk a late payment. With ChargeOver, you'll never be in that situation again. When it's time to bill the customer, ChargeOver will automatically charge the saved payment method such as a credit card or ACH. You can create and customize an unlimited number of payment plans, and even make one-time charges, all in one place. 2. Earn more recurring revenue. 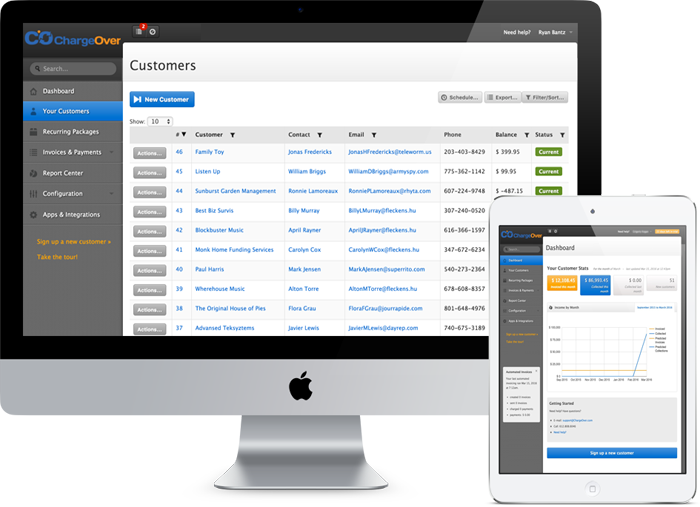 Start offering a recurring or subscription service and put billing on auto-pilot. Have more time to run your business, or just sit back and enjoy the steady cash flow. If you already offer a monthly payment plan or subscription, it's easy to import your customers from QuickBooks into ChargeOver and automate the billing. Stop stressing about who needs to be charged, when, for what, and for how much. Set it once in ChargeOver and let the software do the work for you. Based on each customer's payment plan, ChargeOver will automatically generate an invoice in QuickBooks, charge the payment method on file, record the payment, and send a confirmation. 3. Save time on data entry and communication. When you create or update a customer in ChargeOver, the information will automatically be updated in QuickBooks. ChargeOver will also generate, send, and mark invoices as paid in QuickBooks for you... All on its own. Save hours of your time and avoid embarrassing data entry mistakes. 4. Get started in a few minutes. We know you're busy, so we made it super easy to get started. There are no contracts to sign and no development work to do. Oh, and your first 14 days are on us! Set up recurring billing for QuickBooks now: Create your ChargeOver account!